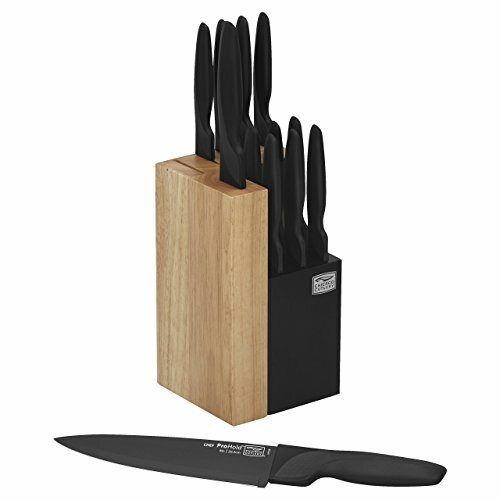 Chicago Cutlery's ProHold 14-Piece Dual Knife Block Set includes: 8-inch chef knife, 8-inch bread knife, 5-inch serrated utility knife, 5-inch Santoku knife, 3-1/2-inch paring knife, 3-1/4-inch peeler knife, and six 4-1/2-inch steak knives. The black, non-stick coating looks great and prevents food from sticking to the blade during meal prep or dinner. An ergonomic, slip-resistant textured handle provides superior control for easy and accurate cutting, while the shape of the handle promotes the correct holding position for the perfect cut. The attractive, space-saving dual wood knife blocks nest within one another or separate to allow easy access to all your cutlery, and their two-tone design gives your kitchen a modern, professional look. Chicago Cutlery's ProHold 14-Piece Knife Block Set comes with a full lifetime warranty. Hand washing is recommended. Chicago Cutlery's ProHold 14-Piece Dual Knife Block Set includes: 8-inch chef knife, 8-inch bread knife, 5-inch serrated utility knife, 5-inch Santoku knife, 3-1/2-inch paring knife, 3-1/4-inch peeler knife, and six 4-1/2-inch steak knives. The attractive black non-stick coating prevents food from sticking to the blade during meal prep or dinner. An ergonomic, slip-resistant textured handle provides superior control for easy and accurate cutting, while the shape of the handle promotes the correct holding position for the perfect cut. Space-saving dual wood knife blocks nest within one another or separate to allow easy access to all your cutlery, and their two-tone design gives your kitchen a modern, professional look. Chicago Cutlery's ProHold 14-Piece Block Set comes with a full lifetime warranty. Hand washing is recommended.